Swing, classic jazz, crooners, American Songbook, Bossa, sophisticated music, Latin, sultry tones, vintage lounge & pop, nightclub jazz. Who could better symbolize glamour than Sue Moreno? This beautiful diva from Holland is endowed with many talents.Trained in the American school, a singer, dancer, model and actress, she is capable of expressing her art in all these fields with equal success. The moment she appears cameras and microphones focus on her. In an already successful career, Sue Moreno has appeared on many stages and in festivals all over Europe, Scandinavia and the USA. Considering her varied repertoire, her charisma and her immense presence on stage, she is unique in her category. With her innate sense of swing and her overpowering sensuality, she is at ease with all jazz standards,the syncopated rhythms of rock and rhythm’n’ blues, as well as t he most evocative ballads and latino memories. Gifted with a sensuous voice in tune with her physique,this fiery brunette is at ease within all spheres of American music. 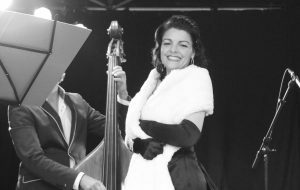 She rarely misses a reminder to her idols, Marilyn Monroe, Peggy Lee, Julie London, Elvis Presley or Etta James etc…which she distills to her audience throughout her amazing show, the Sue Moreno Glamour Show. Sue Moreno, an artist committed to ideals once thought of as common necessity to anyone serious about a career in performing arts. I would like to say pre 1960s, but that’s unfair because many of the great singers, dancers, band leaders, arrangers and composers have careers still going and fine works still appear to date. I like to equate her with old Hollywood and the days of star development in the great studios. There is that style and glamour yes, but in those days everyone could sing, dance and act. It was expected of any professional. Sue Moreno has all those bases covered. Always appearing and sounding perfect (she doesn’t own pair of blue jeans – don’t expect her to perform in anything but the finest custom designed dresses). Sue is trained in many forms of dance and the dramatic arts, but for me, it was the sound. Sue’s phrasing and tone are just not heard today, I am afraid to guess at how many country divas are recorded in my town daily that belt it out right over the top. I challenge you to find any of them that have the control, technique and attention to the details Sue Moreno has mastered. This also translates to her appearance and image. One word comes to mind “style “. I cringe at the expression “pin up” because someone with this degree of commitment to details should not be cast into the category of nostalgia or campy retro. Sue is a knock out brunette but has somehow avoided the trashy and stayed with the classy. Play this song by Sue Moreno – I am looking out the Window.